If she played her cards right......she could get lucky with me! That VTI BL503 is something we might consider. A reservation though would be how does it handle being bumped by a wife running a vacuum cleaner? 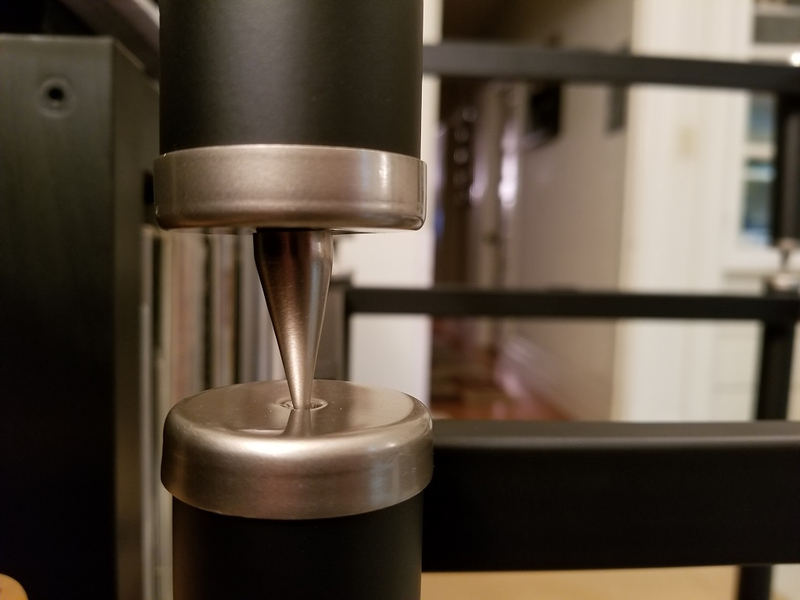 Do the points sit into a dimple of some sort to help lock/stabilize the shelves? Trying to put together my VTI rack right now, and one of the points doesn't line up with it's recession below. It's "off" and not aligned properly. Not sure how to get around this. IS the post cross threaded possibly, causing it to be slightly canted> IDK, just spit balling. Nope. All of the points have screwed in fine so far with no cross threading or seizing issues. It's just the physical alignment of that corner's shaft I think. If I grab it super hard and pull it aligns, and then when I let go it goes back to misaligned. It's like the metal frame itself and/or the welds are slightly off. It should align itself once the rack is loaded with equipment . I had one like that with my VTI. Looks like that's one of the 12" legs. Right? I used my feeble nerd arms to use brute force and bend it, and now it's aligning better. Yay. Edit: Tony, it was one of the 7" sections. Does the top side line up correctly? You could stick a pipe that just fits in it and try some manual persuasion. That should work. It just needs a bit of caressing. VTI has suggested to folks whack the leg with a rubber mallet. Experience with hammer wielding to achieve a desired result will help assure a positive outcome. One could dent the leg though. TNT's above suggestion sounds good. The caps come off easily, just be careful of the finish. Or like machone said, load it. Yeah, I see now in the instruction manual that they mention a rubber mallet may be necessary due to things getting knocked out of alignment during "shipping and handling". AKA, if your rack was made at the factory on a Monday vs. a Friday. They've had issues like that going back years and years and why I'll never recommend a VTI rack or stands. You'd think by now they would have fixed their quality control problems. I figured at this price point that the quality would be better than this. I had a few more alignment issues with another frame piece. The end caps did not seem to be hammered down all the way, they are simply not installed evenly. I couldn't get them to budge, but I might try putting a towel over them tomorrow and giving some light taps with a hammer to see if I can fully seat them. 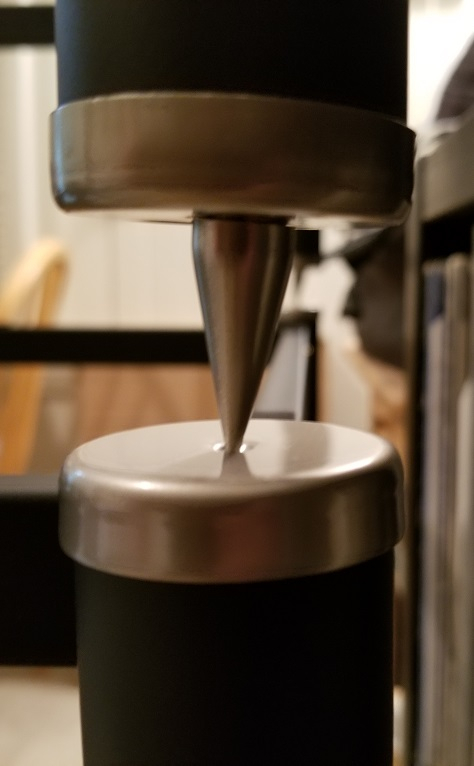 Additionally, two of the end caps that you screw the spikes into had little raised lips on the surface where the spike meets the cap - the metal wasn't completely flat like the others. 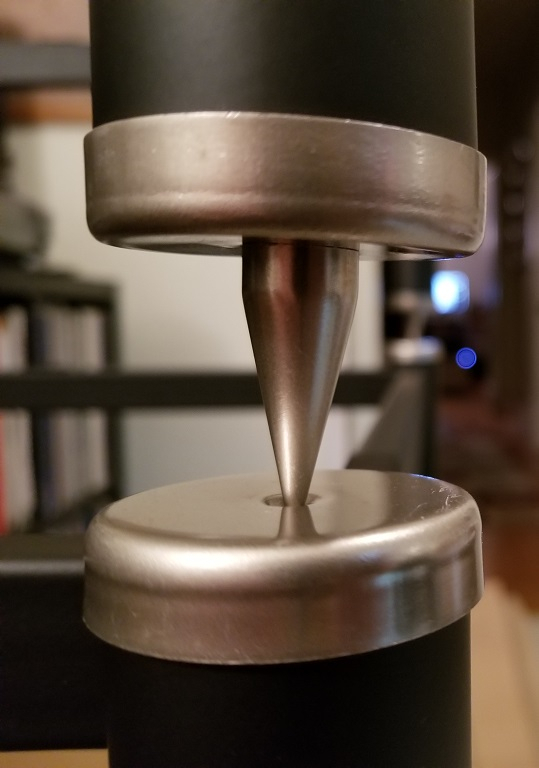 As a result, the spike's alignment when fully screwed in is skewed and not straight/90 degrees. This isn't "oh it might have gotten misaligned during shipping", but rather straight up poor quality control. when you put equipment with weight on the shelf it will align. 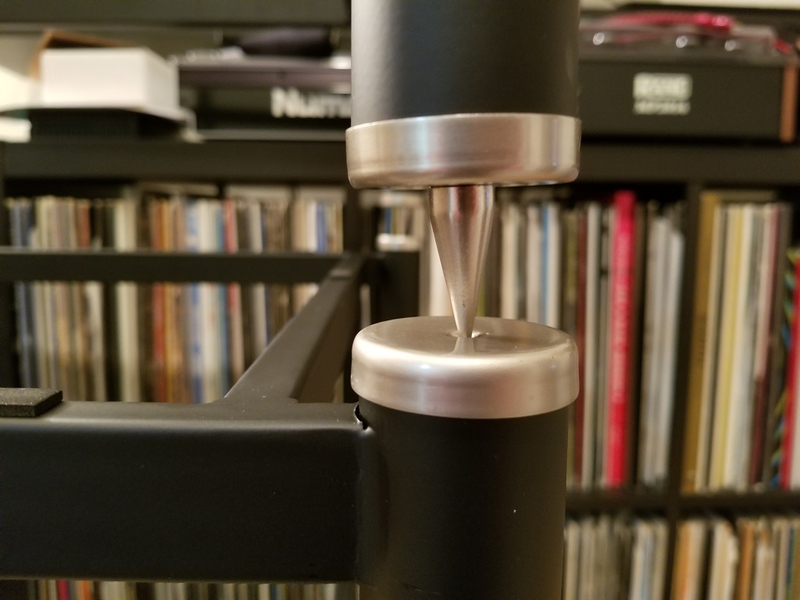 The section that I posted about earlier is the only one that required brute force to try to bend and fix the alignment, which I was able to do. The others are aligned as it stands currently, it's just visually disappointing to see the silver caps not installed correctly and two of the spikes coming down at something other than a 90 degree angle. That's what I meant about poor quality control. It's just not built to as exacting standards of fit and finish that I would expect for the price. Shrug. Sadly, you never know what you're going to get these days. The rack I had from VTI had no issues whatsoever. Sorry about the trouble you're experiencing with it. 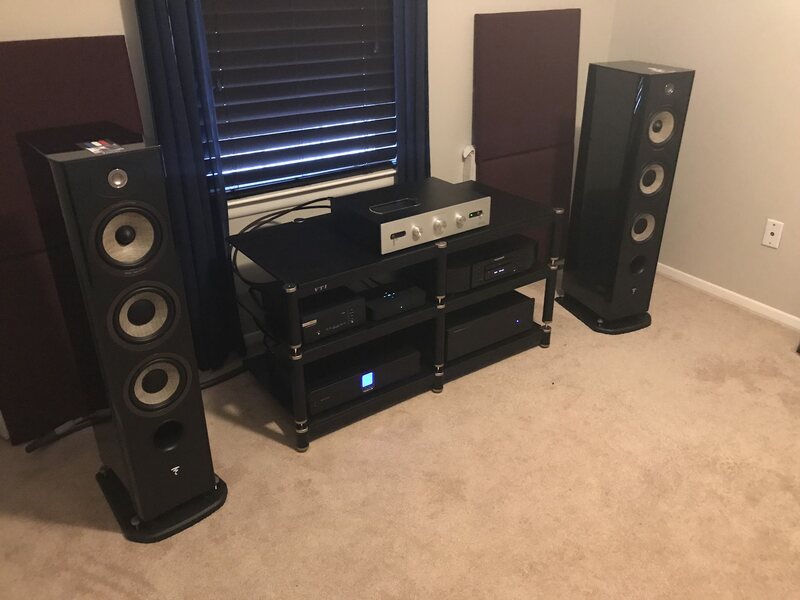 Though these are nice looking racks, and, appear to be decent solid racks, they are, by far, on the lower end of the price spectrum when it comes to audio racks. If you can get it lined up after putting some weight on it, and are happy with the overall look and stability, I'd forget all about that little detail and be thankful that you got a nice looking, fairly stable rack at that price point. I'm still balking at spending somewhere in the $2K-$3k range for what is still a "fairly priced" rack. I'm seeing stuff in the $10k and up range. I should be used to it by now. It seems like with every major purchase I make there's something not quite right. I have bad luck I guess. 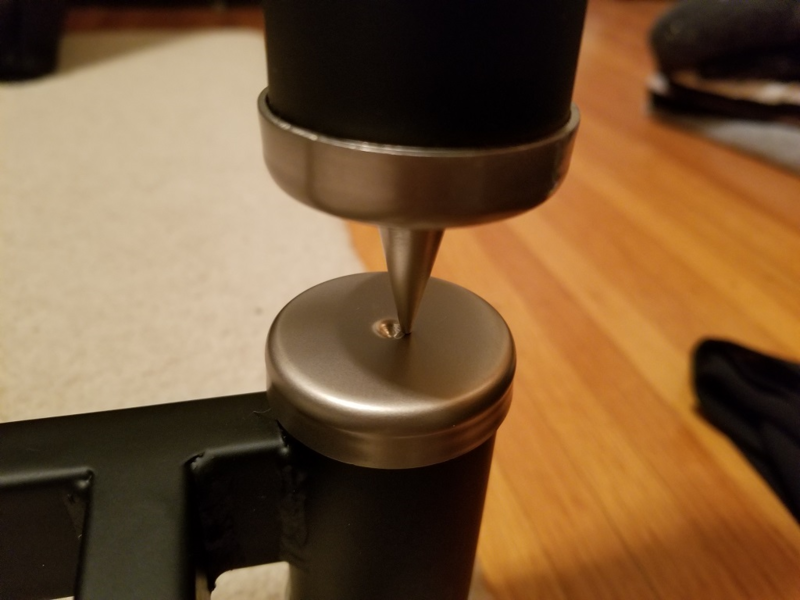 I would expect this quality out of the sub $100 Monoprice rack listed earlier in this thread, not a $400+ VTI. The caps not being assembled correctly and the spikes coming out at a wonky angle are more than a "little detail", imo. The fact is, it doesn't look like the product photo shown on their website. I get that made in China stuff can vary wildly in quality, but I don't think you'd be happy either if you just had purchased this, despite it being on the cheaper side of audio racks. All of the other metal shelf units are "acceptable", but this one should not have passed QC, imo. I'm tempted to just order another shelf. Those are typically much higher maintenance. Plus, sometimes the "spikes" come out at a wonky angle. In this price level that is inexcusable and totally unacceptable! I'd be raising hell. My VTI is not anything like that one... everything looks good and aligned. I bought mine 10y ago. Sorry buddy, do they send you new endcaps or replace the stands in question? 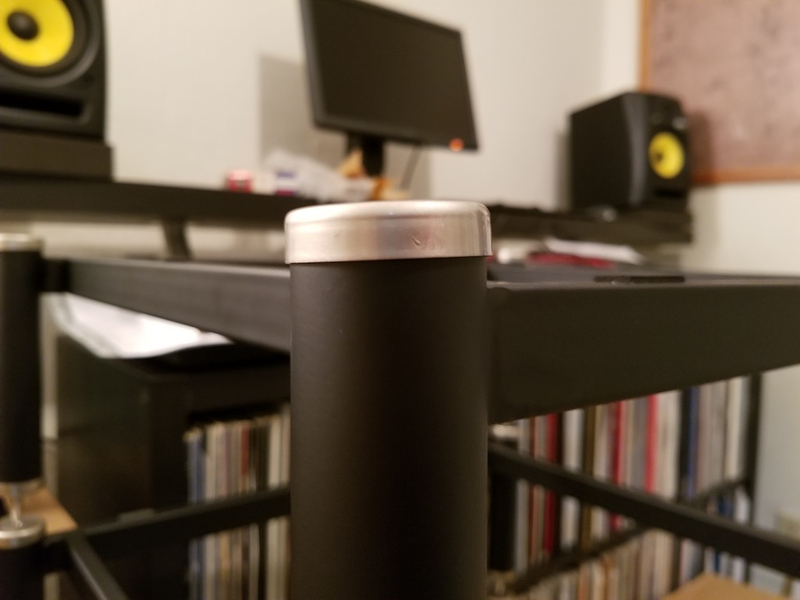 Having owned a couple of VTI racks, the end caps on the older racks were much thicker than the new ones.